He was an American, a world traveler. One summer he found himself in a European tour group with Norway on its itinerary. This was a country he had never visited and with which he had not even remote ties. 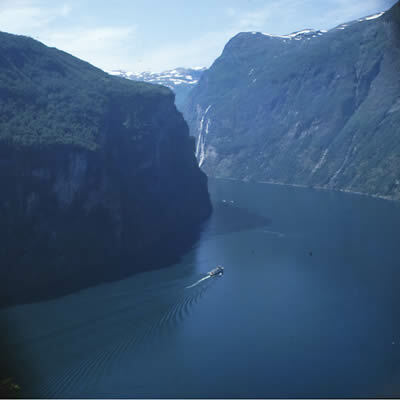 Along Norway’s west coast are magnificent fjords---narrow, glacially formed arms of the sea reaching many miles inland. South of Alesund, ships often sail into the Stor Fjord and maneuver their way between the cliffs of its remotest inlet, the Geiranger Fjord. Here, a small vessel sails past the fabled waterfalls, The Seven Sisters, toward the tiny village of Geiranger lying sheltered at the fjord’s inner end. This small, out-of-the-way country on the northwest edge of Europe affects most of its visitors this way. Yet when one realizes its rather remote geographical position, it is hard to imagine a less likely place for an “international park.” The latitude of Norway – between 58º and 72º north – is only slightly farther north than the latitude of Alaska. Forming the western border of the Scandinavian Peninsula, Norway is shaped like a tadpole, with an oval body forming its southern part and a long tail extending to the north. The country is eleven hundred miles long, roughly the distance from New Orleans to Minneapolis. Its width ranges from four to two hundred seventy-five miles, with a land area similar to that of New Mexico. It stretches from the Skagerrak and the North Sea on the south and west, to the Norwegian Sea and the Barents Sea on the north. Much of its border is seacoast, with the most direct route around the coastline 2,125 miles. Actually, because of the extreme irregularities of the coastline, the real sea perimeter is more like thirteen thousand miles. Those unfamiliar with Norway might expect it to be a bitter, unwelcoming land, positioned as it is with the Arctic Circle bisecting it almost in the middle. Yet geography also provides it with a moderating boon in the form of the Gulf Stream, which moves from the south coast of the United States across the North Atlantic, to bathe the Norwegian seacoast and keep its waters ice free the entire year. As a result, average temperatures throughout coastal Norway are milder than this latitude would suggest – with temperate winters, cool summers, and abundant rainfall much like America’s Pacific Northwest and Canada’s British Columbia. 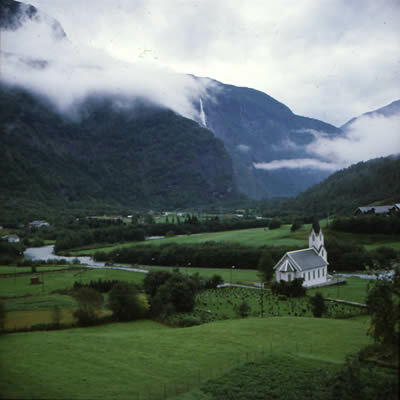 Inland, Norway has warmer summers, colder winters, and less rain – similar to the weather in America’s Upper Midwest. Traditionally, Norwegians thought in terms of two seasons, summer and winter. Spring and fall are imported concepts, regarded as brief reminders that the next season, a longer one, is approaching. The Fortun church in luster, where God's presence is felt and worshipped in southern Norway. Where breathtaking fjords, steep mountains, water-abundant waterfalls, blue glaciers and luxuriant valleys add to his granduer. The dominant influence on Norwegian life is the sea. It is therefore helpful to view the country first from the seacoast, a journey often made by travelers in search of natural splendor. They are not disappointed, for in addition to the constant extremes of mountains and valleys, there are two dramatic features that distinguish this seacoast from nearly all others. These are the Skjærgard and the fjords. The mainland is protected from the open ocean by a necklace of about one hundred fifty thousand islands called the Skjærgard, or “rock fence,” representing a significant 7 percent of the total land area. They shelter old harbors, large and small, that for centuries have served an unending stream of seafarers who have demonstrated Norway’s maritime prowess across the world’s oceans. Along the entire coastline are many fjords, those narrow fingers of the sea stretching inland, some for more than a hundred miles. They are sharply defined by steep cliffs rising from the water’s edge and reaching down to ocean depths, which distinguish them from ordinary bays and inlets. Most of these one-time glacial valleys lie along the west coast, with the most dramatic of them in the southern third of the country. Approaching Norway by boat across the Skagerrak from the continent, one sees jagged mainland border and coastal islands fringed with white frame dwellings and countless piers and boat docks. The sails of pleasure boats mingle with fishing and cargo vessels on blue waters along a shore mottled with small fields and wooded hills. Kristiansand, a community of sixty-five thousand, is the best known port on the south coast. Situated on a small peninsula, its central area is laid out in uniform, rectangular blocks, a highly unusual configuration in a country where people’s living arrangements are almost totally at the mercy of an irregular terrain. Kristiansand has a long history as a commercial and shipping center, and remains the focal point for rail and auto traffic seeking south coast shipping facilities for timber, metallurgical, and agricultural products bound for other countries. 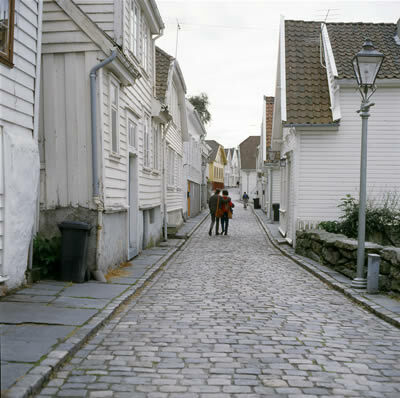 A street in Stavanger retains the flavor of the past. The cobblestone pavement remains; houses, showing various signs of age, crowd the narrow sidewalk. Modern lighting has been added, and today’s traffic makes its way, even though two vehicles may find it difficult to pass. Many old thoroughfares, now designated as walking streets with limited vehicular traffic, are used for outdoor cafes and open-air shops. Sailing westward, one skirts a landscape filled with contrasts. At water’s edge, well-cultivated fields thrive on moraine land, before a backdrop of rock or heather-clad hillsides. Near Stavanger, an important harbor since its founding in the eighth century, the true fjord country begins as the southwesterly curve of shoreline bends to the north. It has always been a key fishing port, and was the embarkation point in 1825 for the sloop, Restaurationen, which carried the first fifty-two emigrants leaving for the New World. In the 1970s, after oil was discovered in the North Sea, Stavanger became a boom town of foreigners mingled with natives. The population now totals nearly on hundred thousand. As the first center for Norway’s emerging petroleum industry, Stavanger found its historical emphasis on fishing and canneries nearly elbowed aside by rapid change. Today, the port is busy not only with boats, but with the construction of off-shore oil rigs. The town combines the old-world charm of narrow, winding streets and an eight-hundred-year-old cathedral alongside the construction projects and commercial bustle of the energy business. North from Stavanger, the islands of the Skjærgard, some inhabited but many not, proliferate in number, and increase in cragginess and size. A boat can wend its way through their channels into the Hardanger Fjord via smaller fjords just north of Haugesund. The surrounding, heavily wooded mountains are often snow capped, occasionally reaching elevations of five thousand feet. Such elevations do not impress mountain lovers, that is, until they glimpse a peak rising directly from sea level, reflected in quiet, deep-blue fjord waters. Undoubtedly the best-known western port is Bergen. With a population of 210,000, this is the second-largest city in Norway, next in size to Oslo, the capital. Centuries ago, Bergen was a commercial center linked with other countries, while Oslo was still a village. The land rises quickly to provide a sort of amphitheater around Bergen’s excellent harbor. Ships docking there offer a close-up view of its famed Hanseatic wharf with its cluster of buildings dating from the Middle Ages, once the focal point of trade and cosmopolitan activity with Europe. Sharing the wharf with this bit of history is the equally well known open-air market, a daily delight for sightseers as well as shoppers for fish, meat, fruit, vegetables, and flowers. 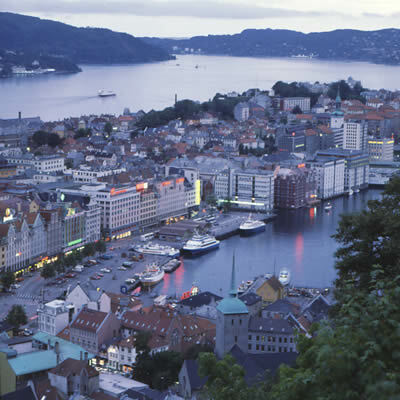 Bergen is considered the gateway to the fjords of Norway. Where the land is lush, the fjords are filled with boats, and the city is bustling with people. History, culture, and commerce surrounds it. Rich in diversity there is always something exciting to do in Bergen. It resembles Seattle, its sister city. They have similar climates, and both are west coast ports. At Bergen, as at all the major ports, the air is filled with the briny tang that surrounds fishing vessels returning from successful runs. Sea gulls swoop and shriek overhead. Cruise ships disgorge hundreds of passengers with cameras and hiking shoes, bound for a few hours of land pleasures. Freighters load cargo destined for faraway places. Amid these imposing ships maneuver hundreds of small craft engaged in more private forms of business or pleasure. The rest of Bergen, strewn up the hillsides, is a business and cultural center, as well as the south entrance to the most popular tourist area of the country, which includes numerous fjords, mountains, and plateaus. A favorite trip for visitors is a ride on the funicular railway up to Fløyen Restaurant for a bird’s-eye view of the harbor. Music lovers covet a concert at the magnificent concert house, Grieghallen, or at Troldhaugen, the home of Edvard Grieg. Each year in late May and early June, Bergen hosts an arts festival that attracts performing artists from all over the world. North from Bergen, there is another, and very special, option for viewing the coast of Norway. One can book passage on the Hurtigrute, the “fast route,” a fleet of daily service boats plying western and northern waters. Although it is a comparatively slow and leisurely route today, taking eleven days to make the round trip to Kirkenes and back, it deserved its name in the days when inland transportation to the northern reaches of Norway was next to impossible. Hurtigrute boats stop at thirty-five ports, delivering and taking on passengers, mail, and commercial cargo. In America, it would be called a milk run, yet each year twenty-one thousand tourists manage to take this trip along with the local travelers. The newest ship of the line has two hundred berths and space for forty cars. The passenger sailing north from Bergen is invariably stunned by the prodigal beauty of islands, peninsulas, mountains, and villages mixed helter-skelter among bays, estuaries, straits, fjords, and silvery waterfalls. Nothing here is as tame as a cove! Trying to follow the coastline from Bergen to Trondheim on a map is thoroughly bewildering, yet around each curve is a splendor more dazzling than the last. About sixty miles north of Bergen lies the Sogne Fjord, which runs inland for 125 miles and reaches a maximum depth of over four thousand feet. It and its slightly shorter, but more northerly, sisters – the Nord Fjord and the Stor Fjord – are featured destinations for travelers by cruise ship, train, boat, and auto. Visitors jostle for camera angles adequate to capture even a part of the stunning vistas to share with those back home. Cruise ships come all the way inland on several of the fjords, including the Sogne Fjord, and a network of ferries runs regularly to accommodate land travelers, as well as local commuters crisscrossing the fjord country. In fact, on the Sogne Fjord, there is opportunity to change from an auto-bearing ferry to another in the middle of the fjord. One of the cruise tourists’ favorite side trips is to debark at Flåm at the inner end of Aurlands Fjord, an arm of the Sogne Fjord, and ride by electric train up three thousand feet on a twelve-mile trip to Myrdal. From there, one can take a tour bus to the spectacularly situated resort, Stalheim, then down a road of tight hairpin curves to rejoin the ship at Gudvangen on a nearby arm of the fjord. Farming takes on an added dimension when it is carried on in an idyllic mountain setting. In the midst of this beauty, the regular chores must be done. Here, hay is gathered from a small strip of land. 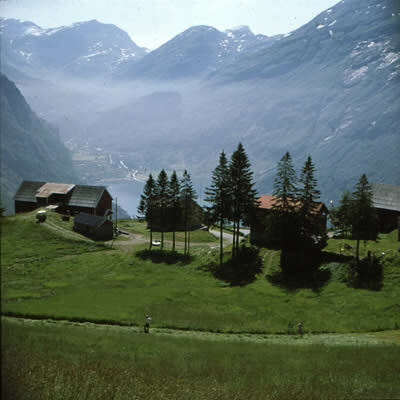 Near a road known as the Eagle’s Way, this farm above the Geiranger Fjord is one of the most photographed in Norway. Shorter in length than the Sogne Fjord, the Nord Fjord is no less lovely. In the nearby mountains lies Lake Horningdal – at 1,650 feet the deepest lake in Europe. Ages ago, it was an arm of the fjord; its waters still tumble and fall through crevices to join the sea waters of the fjord below. Next comes the winding Stor Fjord, whose innermost arm is the fabled Geiranger Fjord. This last narrow channel has been pictured on more postcards than perhaps any other Norwegian scenery. Here are Bridal Veil Falls, Pulpit Rock, and the Seven Sisters Falls with their sheer, parallel drops of hundreds of feet. At the fjord’s inner end is the tiny town of Geiranger, where one can debark for a side trip up to one of Norway’s many glaciers. seacoast is not all there is to Norway. Enchanting variety awaits the visitor going inland from any port. After sailing to the far north, it is a delight to return by auto to the south. Having seen the seacoast, the inland is easier to understand. At the mouth of the Stor Fjord lies Ålesund, a town built on three islands that enclose its harbor. Homes cling to hillsides and ribbons of shore, giving the city an almost mythical charm. Not surprisingly, it is as popular for vacationing as it is utilitarian for fishing and industrial shipping. Trondheim, a city of 135,000, lies at the mouth of the river Nid in the sheltered Trondheims Fjord, where the meeting of sea and land is less violent. The port bustles with activity, as it has since the early Middle Ages when Trondheim flourished as an important trading center and fortress city. It was a focal point both for power struggles and for religious pilgrimages. Old buildings fringe the water and cluster around Nidaros Cathedral, the largest and most famous church in Norway. The fjord spreads out in a broad sweep from the harbor, and the hills here are more rolling than rugged. Many people, both Norwegians and visitors, think of Trondheim as the “north end” of Norway. Yet beyond this port lies the longest part of the journey. Boats thread their way through swarms of islands, many with tiny plots of green and scatterings of homes in the most impossible places. Generally, the land becomes wilder, the rocks rougher, timberlines lower, and the soil less fertile. Occasionally an island juts abruptly skyward as if in surprise at its fairyland setting. The only railway north of Bodo crosses this narrow part of Norway, bringing iron ore from a few miles away in Sweden to Narvik for shipment to world markets. Port facilities include a completely automated iron ore loading dock---the world’s largest---with an annual capacity of twenty-eight million tons. John Steinbeck’s novel, The Moon Is Down, is based on World War II resistance activity in Narvik. greeting of the marchers. Soon after crossing the Arctic Circle, ships dock at Bodø, a town of only thirty-five thousand, which lays claim to being the oldest city in the region. It is the gateway to the real north, say the northerners, and is the last station on the Norway railway system. Beyond this point, the substratum is too weak to support a railway line. Beyond Bodø, at much the same latitude as northern Alaska, the Skjærgard broadens as the continental shelf extends farther into the sea and forms two specific cluster of islands, the Lofotens and the Vesterålens. Both are characterized by steep, jagged peaks and the storms associated with the sea. Enormous colonies of sea birds create a sense of motion on the cliffs. Tiny fishing villages cling to low spits of land on what must certainly rank among the world’s most spectacular home sites, inhabited, certainly, by some of the world’s hardiest residents. Having sailed the tricky course between the islands and the mainland, ships find harbor at Tromsø, which claims for itself the title, “Paris of the North” – a small Paris, indeed, at just fifty thousand people. 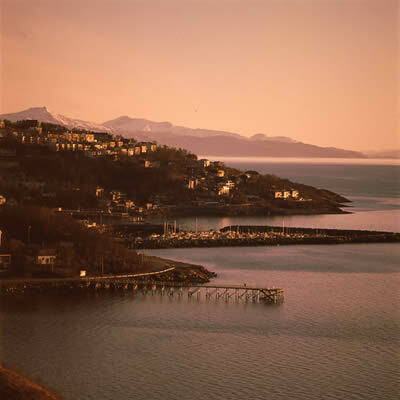 Some might say it lacks the degree of sophistication the nickname indicates, yet Tromsø is a community devoted to fostering culture and education in a part of the world seemingly too physically demanding for cultural niceties to flourish. It is home to the most northerly, and the newest, of Norway’s, four universities, the others being in Oslo, Bergen and Trondheim. Most of Tromsø lies on an island, and two noteworthy features stand out at first glance. One is the bridge to the mainland, a span of thirty-four hundred feet supported by eighty-four pylons, which affords a clearance of 120 feet for ships passing beneath it. The other is Tromsdalen Church, and architectural gem often called the Arctic Cathedral because its dominant position, angular design, and frosty color bear striking resemblance to an iceberg. North and east of Tromsø, the wooded, mountainous coast is modified, yielding to lower, but ever wilder, cliffs. Space seems to expand into a vast landscape as one rounds the top of Norway and nears the end of the Hurtigrute line – and the end of western Europe. Norway meets the Soviet Union at Grense Jacobselv, northeast of Kirkenes. The two countries share a 130-mile border, most of which is defined by the Pasvik River. Sailing towards Kirkenes, ships reach the most northerly point of the route as they pass Nordkapp, or North Cape, which is considered the roof of Europe, although just next to it lies Knivskjellodden, not as spectacular but a mile farther north. However, it is to Nordkapp the visitors go. Here the sea crashes against a thousand-foot barren cliff. No trees adorn Nordkapp, only moss and scrubby grass, and in summer a few wild flowers. Gazing from that promontory out to the ocean, the traveler feels that this is truly land’s end. Here at the edge of Europe, one may pick up a rock and add it to one of several cairns recalling other people, other journeys, and the almost cosmic emotions this sight has stirred through the centuries. Yet Norway has land even father north than Nordkapp. The archipelago of Svalbard – sixty-some islands overlaid with a blanket of eternal ice and snow many feet thick – lies midway between Norway and the North Pole. According to the provisions of a 1920 treaty, Norway governs Svalbard, but the forty-two signatory nations have equal access for peaceful commercial development. The several hundred residents who mine coal there for Norway and the Soviet Union share the space with seals, arctic foxes, and polar bears. Off to the west, some three hundred fifty miles north of Iceland, the tiny volcanic island of Jan Mayen is also part of Norway, but is in habited only by arctic birds and foxes and a handful of military personnel monitoring weather and navigation. 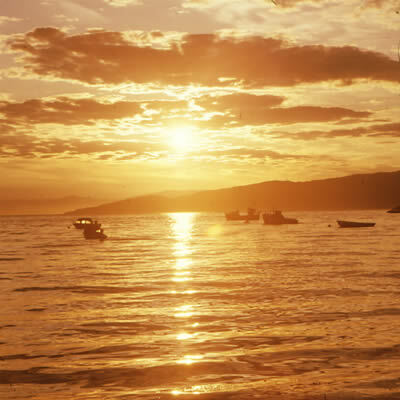 The name, “The Land of the Midnight Sun,” applies in a special way to the area north of the Arctic Circle, where, for more than two months of the summer, the sun never sinks below the horizon. In contrast, the sun disappears completely between mid-November and mid-January. Then electricity provides light for activities. Here at Alto, on the north coast, the sky is a blaze of gold at midnight. These outposts are seldom visited by either Norwegians of other travelers. For most, it is sufficient to sense the lonely north at Nordkapp. Standing there in June or July, one can experience vividly the earth’s summertime tilt that has given Norway the nickname, “Land of the Midnight Sun.” Even in the country’s most southerly areas, midsummer night is only a two- or three-hour twilight. In the north, night does not come at all. If the sky is clear along the northern coast, toward midnight one can watch the beguiling sight of the sun dipping slowly down and then beginning its rise again without ever touching the horizon. Winter brings the reverse. At Nordkapp, there is no daylight at all for more than two months, and, even in the south, daytime lasts only about six hours. However, whether north or south, summer or winter, the weather is livable and activity continues. The combination of the arctic location and the warming Gulf Stream generates an incredible adaptation by all of nature, not least by human beings, who may live on very few hours of sleep per summer night, but make up for it in the winter. Occasionally in July, children are seen playing and parents gardening at two o’clock in the morning in the far north. The drama of the seacoast is dazzling at every season of the year. But beyond its beauty, the presence of the sea exerts an influence on the entire country that cannot be overstated. Yet the seacoast is not all there is to Norway. Enchanting variety awaits the visitor going inland from any port. After sailing to the far north, it is a delight to return by auto to the south. Having seen the seacoast, the inland is easier to understand.